Finding labor that maximizes average product of labor - FreeEconHelp.com, Learning Economics... Solved! Let Q = 1200L^2 –L^4 where L is an input (for example, labor) and Q is the associated output. First, we want to find the level of the input that will maximize the average product of labor or APL. Second, we want to find out how much output is produced at this level of labor. 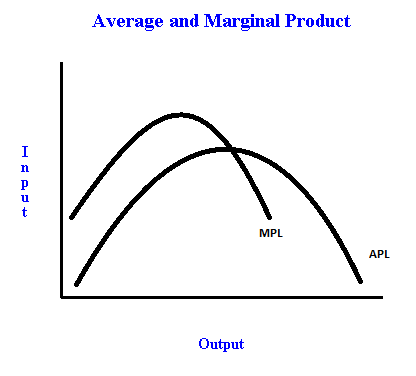 Third, we want to actually calculate the average product of labor (APL). And finally, we want to derive the marginal product of labor (MPL) for this amount of labor. In order to find the maximized average product of labor we need to change the production function into an average product of labor function by dividing both sides of the equation by labor or L.
L = 20 which is the average product of labor maximizing amount of labor. The marginal product of labor is the output that the next unit of labor produces. We can find this by either solving for Q when we have 19 and 20 units of labor (this is not exact) and finding the difference or by taking the derivative and plugging in our optimal labor amount. Which is good that it equals our APL because they should cross at APL’s max (the MPL curve crosses the APL curve from above). It was brief and well summarized. Appreciates!!! You said to plug the APL maximizing quantity of labor in to the production function but then you plugged it into the APL function (1200L – L^3); should it not have been the original equation (Q = 1200L^2 –L^4) instead? Beauty basics, for example, cosmetics, Song Hye Kyo Wrinkle Cream hair care products, skincare, and nail care needs, it is fundamental to most ladies to have everything in stock each day.